If you’ve been dazzled by festive holiday boat parade displays and considered decorating your boat, but are concerned about lighting and electrical requirements, don’t give up! Advice in planning and meeting your holiday lighting needs is available both online and at your local marine store. To help potential participants in the San Diego Bay Parade of Lights (sdparadeoflights.org) determine their power needs, organizing committee member John Campbell teamed up with John Valle, assistant manager at West Marine at 1250 Rosecrans St. in San Diego, to conduct a boat lighting seminar geared especially to first-time participants. If you didn’t know about or couldn’t attend this year’s seminar on Nov. 19, Valle, aka “the electrical guy,” is happy to answer boaters’ questions about calculating and providing adequate onboard power for holiday light displays if you stop by the store. 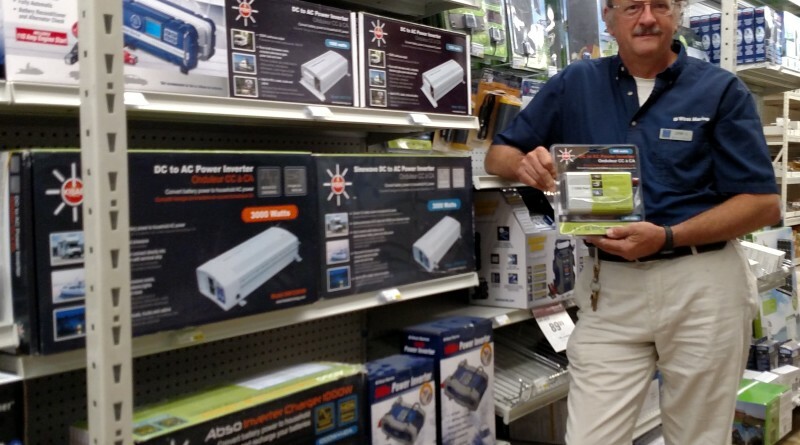 Knowledgeable staff at other West Marine locations can also advise on calculating lighting display power requirements. In designing your lighting, think of your boat’s configuration and how you’d like to illuminate it plus how extensive a display you desire. “One absolute rule: don’t ever submerge your lights or put them so close to the waterline that they could be submerged,” Valle said. Keep them at least 1 foot above the water, including unanticipated waves and wakes. Plan to use only good quality or commercial grade Underwriters Laboratory-approved outdoor-rated holiday lights. Newer-style LED lights are far safer and more economical than older-style incandescent lights because they use only about one-eighth the power and produce far less heat, thus reducing fire hazard. They also provide brighter, more vivid light and are more durable, lasting longer than incandescent lights, Valle said. He stressed the importance of following manufacturers’ instructions to determine how many watts are required to power each strand of lights. A typical string of 100 LED mini-lights uses about 10 watts or less, he said. Decide how many strings of lights you’ll need for your display and total up the number of watts required for the lights as well as for any lit signs or figures, such as snowmen, reindeer, Santas, etc. As a rule of thumb, with 120 volts AC power, divide your total watts by 120 to calculate the number of amps required. To help plan your energy needs, see the article “Christmas Lights Power Consumption” at christmaslightsetc.com/pages/how-much-power.htm, applicable to boats as well as houses. If in doubt, seek expert advice. Use only marine or outdoor-grade 10 or 12-gauge extension cords along with compatible water-resistant connectors and sockets in wiring your lights and other ornamentation. Extension cords should never feel hot when in use. Never connect more strings of lights together than the manufacturer recommends, Valle stressed. Because LED lights are far more energy efficient, most larger boats will have adequate power capacity using just their existing generator and battery-powered inverter. This avoids the fire hazard and noxious fumes from extra portable generators. For a major lighting display, using hundreds of strings of lights, you may need to supplement your existing onboard power with a generator or inverter to avoid draining your main battery bank. Marine stores can recommend appropriate equipment for your specific needs. Before mounting your lights onboard, always test them and replace any burnt-out bulbs and, to reduce fire risk, never use anything with frayed or worn wires. While outdoor lighting and lit decorations are widely available, City Lights, the year-round holiday store located at 1212 Knoxville St. in San Diego, is a treat for the imagination. Here sales associates can help you assemble almost everything for a brilliantly lit, memorable holiday display. Go ahead — do it. Decorate your boat!